One of the many great things about living and working in London is having some of the greatest art and fashion exhibitions pop up on your doorstep. 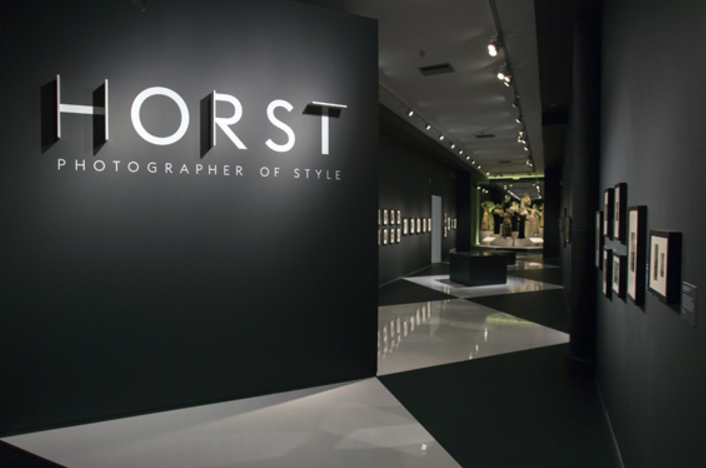 The most recent being Horst: Photographer of Style at the V&A, which opened last month and we couldn’t wait to check it out. The exhibition, which runs until early January presents a definitive retrospective of the work of Horst P. Horst, one of most iconic fashion photographers of the 20th century who’s work graced the covers of Vogue Magazine, Harpers and Queen and House and Garden from the 1930s. The exhibition guides you through Horst’s 60 year career from pre-war Haute Couture and working with Dali and the Surrealism movement in Paris to his post war move into nature photography and then onto colour photography based in New York. It was fascinating to get an inside look at the photographer’s world and to learn more of his close relationships and work with some of the most iconic designers of all time including Coco Chanel and Elsa Schiaparelli. A highlight was the presentation of Horst’s Vogue covers – some of our favourite of his images (obviously). Over 90 issue of Vogue from Horsts’ career are displayed side by side creating a wallpaper effect of vintage Vogue covers – a dream for any fashion fan to witness! The exhibition is on until the 4th January 2015, if you love photography and fashion this is definitely not one to be missed!